These 7 online shops sparkle with joy! Shak-shuka.com: Shak-Shuka opened with the aim to create a place where you could find the most stylish and eco-friendly items for your family. They only carry eco-friendly brands that are recycled, fair trade, non-toxic, organic or a combination of the above. Durability, usefulness and beauty are vital in our product selection, while they make their best effort to ensure they are safe, sustainable, and made with respect to the producers.Founded in the Netherlands, Shak-Shuka comes from the word “leshakshek” which means “to shake or mix up”. It is also a dish in the Middle East and is a bit of a hodgepodge of ingredients that are all “shaken up”. 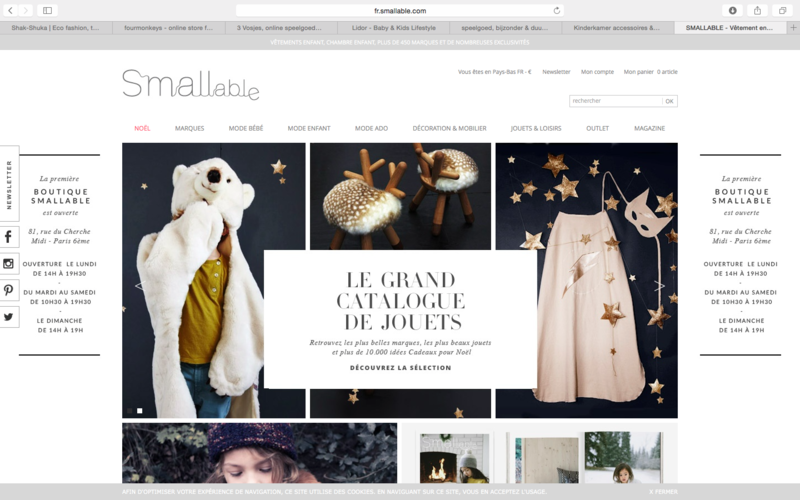 Smallable.com: SMALLable is the fashion and design concept store for kids from 0-16 years old. In order to offer you a top-quality selection at affordable prices that you won’t find anywhere else, combining fashion, furniture, decoration, games and books for babies and kids, their buyers search the globe for those special, hard-to-find gems with one thing in mind… or maybe two: creativity and practicality! 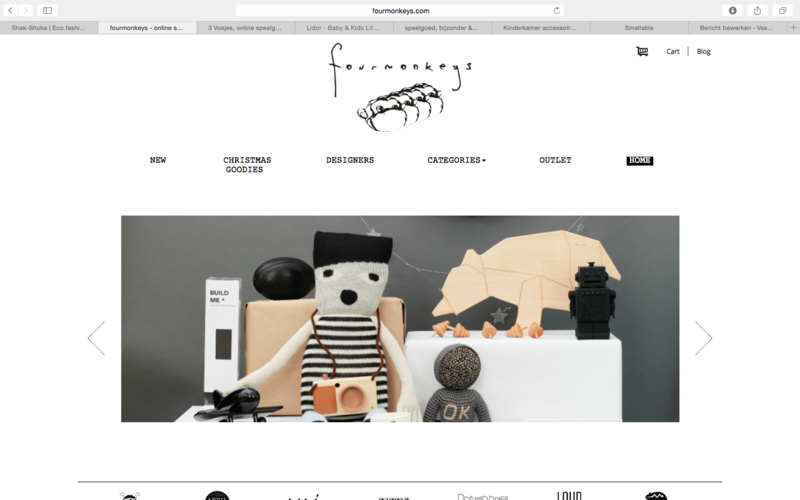 Fourmonkeys.com: Four Monkeys is an online store with amazing finds for children. Our wishlist from there is endless! Not only is it a shop full of wonderful goodies it is also run by the loveliest of ladies. 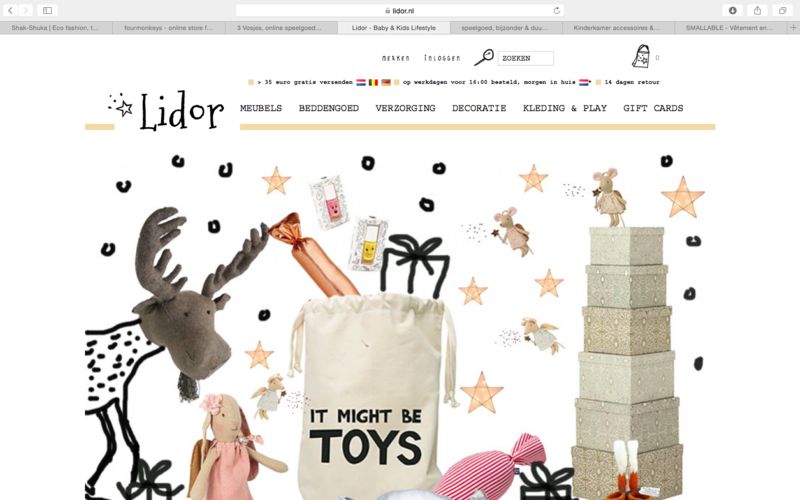 Lidor.nl: the Dutch owner Margaret Wanningen started this shop originally with imported vintage rattan baby cots, but expanded it rapidly from her home with clothing, bedding and wonderful toys. 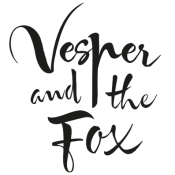 Their site is beautifully designed and orders are personally wrapped and signed. 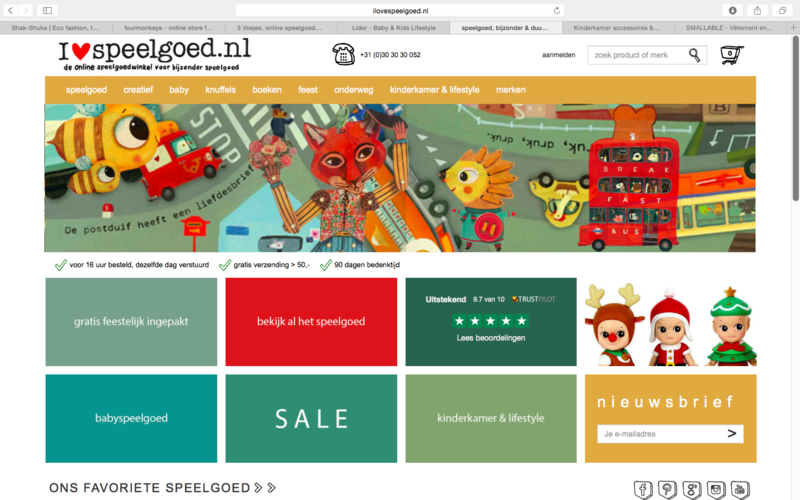 ilovespeelgoed.nl: this was one of the first online shops we both loved from the start. This golden ‘oldie’ has everything for your child to play with. If you need a special birthday present or something for a newborn, they have it all. They collect their stuff from all around the world and make sure it’s completely liked by the little ones. Go check it out! 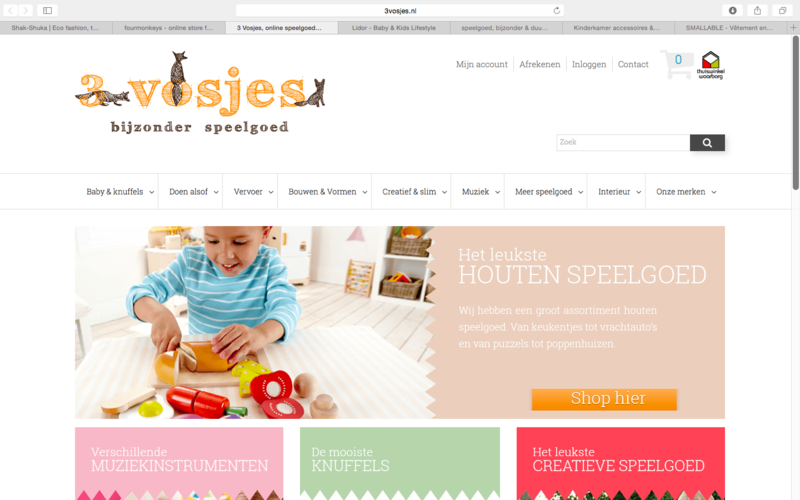 3vosjes.nl: the people of 3 Vosjes (Sander and Femke) share their love for toys that give you a great feeling. They love toys that give you beautiful memories and have lots of fun with. Next to that the toys challenge the children to be creative and explore the world. 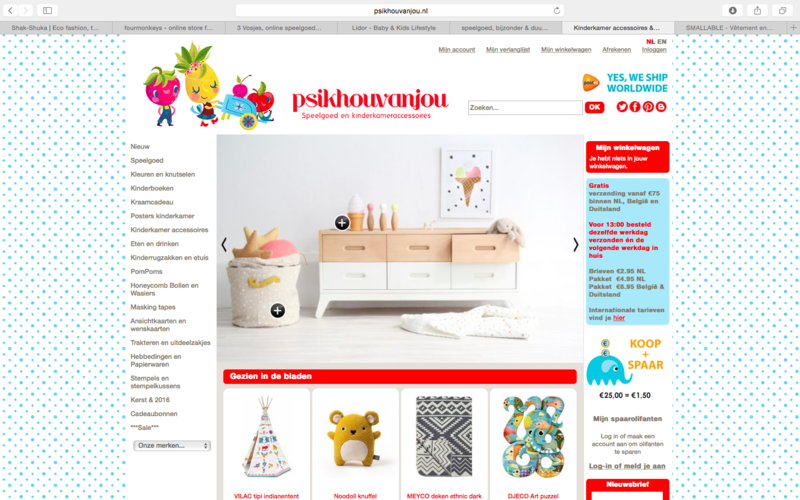 psikhouvanjou.nl: PSikhouvanjou is a shop with toys and children’s accessories that are decorative, illustrative, funny and innovative. Looking for the latest toys and stylish nursery accessories brands? You will certainly find it at PSikhouvanjou.In their toy collection you will find: DJECO, Janod, VILAC, Le Toy from Plan Toys, Kid O and Skip Hop. The beautiful and fashionable nursery accessories brought by Nobodinoz, Tell Kiddo, Noodoll, OYOY mini kids, Ferm Living, Kids Depot, Heico and roommate. Their personal attention and festive way of packing is particularly appreciated by their customers and makes PSikhouvanjou a unique shop. And if you are in desperate need of some toy inspiration, please feel free to pick up some ideas at our Pinterest page.